The Arctic Monkeys are back again on tour and will be releasing their highly anticipated forthcoming album “Tranquillity Base Hotel & Casino”, which will be released on the 11th of May. But before their new album dominates the charts enjoy an evening with the Arctic Monkey’s as well as the supporting act, The Lemon Twigs. Prepare yourself for a night of Indie rock as they perform their number one songs, such as, “Why’d you only call me”, “Do I wanna know” and “R U Mine?”. Do you want to bring the groove back into your life? If so, this fun-filled evening is the ideal concert for you. Get into the groove and party like you’re at Studio 54 with appearances from Odyssey, The Trammps and The Three Degrees. This is definitely an evening designed to entertain the whole family. If you’re a Whitney Fan then this stunning tribute to her incredible career is the one for you. Sing along to some of the much-loved and iconic power ballads that everyone is known to love. Shanice Smith delivers a breath taking performance for this evening event. If you want to celebrate the songs of Whitney Houston then enjoy a more relaxed and sit down concert to relive her career. James Morrison is back with his latest album “You’re stronger than you know” and is performing the best of the old and the new songs for this year’s tour. This is a perfect evening for some romance, talent and quality time with your loved one. The classic and much-loved band are back for their Anniversary tour. Bringing some of their fan-favorited songs with them, such as “Dreams”, “Go your own way” and “Think about me”. This is an experience not to be missed so let the champagne and celebrations begin as you watch one of the best British bands from the 70’s. 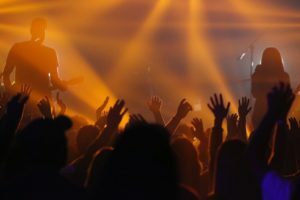 If you aren’t ready for the night to end then why not let The Organisers plan the rest of your evening with a one-night stay in a luxury hotel close by to the concert, or indulge yourself in some of the best restaurants in Sloane Square. If those ideas aren’t tempting enough, then a morning massage at one of the hotel spas is bound to do the trick.